Siwoo Kim, 17, was born in South Korea. He began his musical studies at the age of 2-and-a-half, taking lessons from his mother. At the age of 10, Siwoo became a student of Roland and Almita Vamos at the Music Institute of Chicago, and made his first solo debut with orchestra. Since then, highlight performances of his career include his first solo recital, a broadcasted performance in the 22nd Annual Young Steinway Concert Series, a performance with the Westerville Symphony Orchestra, and several performances with the Columbus Symphony Orchestra. 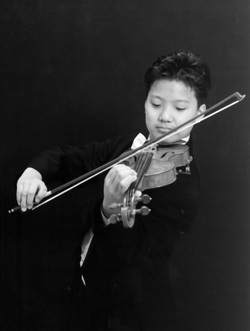 Siwoo has won the junior and senior divisions of the Columbus Symphony Orchstra’s Young Musicians Competition. He has won the Sejong Music Competition, MYA National Concerto Competition, and was awarded a best violinist award, a recital opportunity, and a full scholarship to the renowned Aspen Music Festival by the WAMSO Young Artist Competition. Kim is the recipient of significant scholarships from the National Federation of Music Clubs and the Rachel Barton-Pine Foundation. Siwoo also enjoys orchestral music, and thus is a member of his school orchstra, the American Chamber Strings Orchestra, and the Columbus Symphony Youth Orchestra.